John Gottman on what makes marriages work. John Gottman gives helpful marriage tips in this book. In a recent article for Match.com, Seth Wharton cited the work of John Gottman about the importance of husbands to let their wives influence them as part of developing a healthy relationship. As readers of Malcolm Gladwell’s Blink know, Gottman is an emeritus professor psychology at the University of Washington who purports to be able to predict, with 91 percent accuracy, a couple’s marriage outcome after spending just five minutes with them. The shorthand: rolling eyes and contempt do not bode well at all. Gottman’s assertions have been contested by Laurie Abraham, a journalist who did some outstanding health journalism for The Chicago Reporter in the early 1990s, and I learned today about his personal history. His father was an orthodox rabbi from Vienna who escaped the Nazi regime and landed in the Dominican Republic. This quirk of history came about after the 1938 Evian conference, during which the Republic was the only nation of 32 attending that agreed to take in Jewish people. In a remarkable racial irony, dictator Rafael Trujillo accepted the Jews because he wanted them to “lighten” the population and on the condition that, if unmarried, they would find a mate and marry within 90 days. Born in the Dominican Republic, Gottman was raised in Brooklyn, New York, Mom’s hometown. 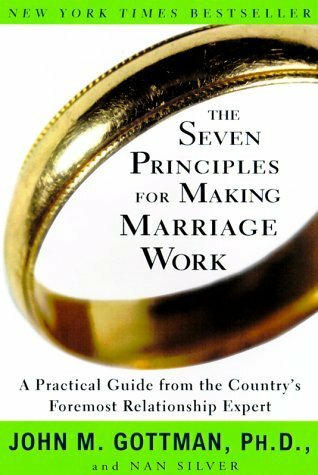 This background information aside, the man’s work on marriage, which he articulates in The Seven Principles for Making Marriage Work, is thought provoking, accessible and, at times, counter-intuitive. Gottman writes about how some successful couples do engage in active conflict that at times they do not process, but instead proceed as if nothing had happened. As mentioned earlier, he does write about the importance of reciprocal influence. Gottman also emphasizes the need to maintain a positive view of the partner and to seek for solutions to problems based on compromise. Sounds like basic stuff, right? I agree, and I found the work helpful both as a roadmap and a reminder of destructive responses one can have to one’s partner. As readers of this blog know, I consider myself very fortunate to be with Dunreith and am always looking for ways to be a better husband. In this book, I fond some useful counsel.